What does the HTTP Archive do? How does the HTTP Archive decide which URLs to test? What are the limitations of this testing methodology? Who maintains the HTTP Archive? The web community uses this data to learn more about the state of the web. You may see it come up in blog posts, presentations, or social media. Scholars cite this data to support their research in major publications like ACM and IEEE. The HTTP Archive crawls millions of URLs on both desktop and mobile monthly. The URLs come from the Chrome User Experience Report, a dataset of real user performance data of the most popular websites. The list of URLs is fed to our private instance of WebPageTest on the 1st of each month. As of March 1 2016, the tests are performed on Chrome for desktop and emulated Android (on Chrome) for mobile. The test agents are located in the Internet Systems Consortium data center in Redwood City, CA. Each URL is loaded 3 times with an empty cache ("first view"). The data from the median run (based on load time) is collected via a HAR file. The HTTP Archive collects these HAR files, parses them, and populates our database with the relevant information. The data is also available in BigQuery. Some metrics like the number of bytes, HTTP headers, etc are accurate at the time the test was performed. It's entirely possible that the web page has changed since it was tested. The tests were performed using a single browser. If the page's content varies by browser this could be a source of differences. Check out Getting Started Accessing the HTTP Archive with BigQuery, a guide for first-time users written by Paul Calvano. For a guided walkthrough of the project, watch this in-depth 30 minute video featuring HTTP Archive maintainer Rick Viscomi. If you have any questions about using BigQuery, reach out to the HTTP Archive community at discuss.httparchive.org. Most websites are comprised of many separate web pages. The landing page may not be representative of the overall site. Some websites, such as facebook.com, require logging in to see typical content. Some websites, such as googleusercontent.com, don't have a landing page. Instead, they are used for hosting other URLs and resources. In this case googleusercontent.com is the domain path used for resources inserted by users into Google documents, etc. Because of these issues and more, it's possible that the actual HTML document analyzed is not representative of the website. A lens focuses on a specific subset of websites. Through a lens, you'll see data about those particular websites only. For example, the WordPress lens focuses only on websites that are detected as being built with WordPress. We use Wappalayzer to detect over 1,000 web technologies and choose a few interesting ones to become lenses. Lenses can be enabled at the top of any report, or by visiting the respective subdomain, for example wordpress.httparchive.org. The HTTP Archive is sponsored by companies large and small in the web industry who are dedicated to moving the web forward. Our sponsors make it possible for this non-profit project to continue operating and tracking how the web is built. See the full list of HTTP Archive sponsors. The HTTP Archive is part of the Internet Archive, a 501(c)(3) non-profit. 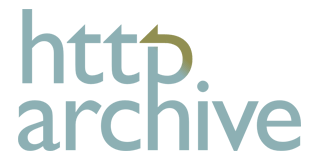 Donations in support of the HTTP Archive can be made through the Internet Archive's donation page. Make sure to send a follow-up email to donations@archive.org designating your donation to the "HTTP Archive". The current core maintainers are Ilya Grigorik, Pat Meenan, Rick Viscomi, and Paul Calvano. Many people have contributed (1, 2) and helped make the HTTP Archive successful over the years. Special thanks to Steve Souders, who started the project in 2010, Pat Meenan who built the WebPageTest infrastructure powering the HTTP Archive, and Guy Leech and Stephen Hay for design help along the way.